If you haven't already signed into Groupon, you can do so HERE. 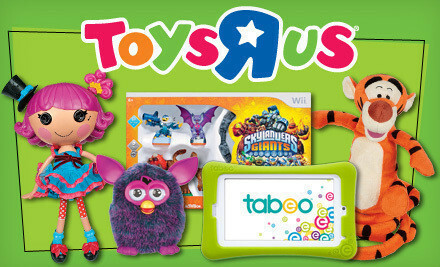 Then, snag the Toys R Us coupon....over 1,000 already sold as of now. The Fine Print: Expires Dec 24, 2012. Limit 1 per person. In-store only. Not valid outside USA. Not valid until 11/23/12 at 5PM. Not valid toward Buyer Protection Plan, gift cards including those for digital content, photo studios, phone orders, special orders, assembly fee, breast-pump rental fee, delivery fee, or shipping & handling. Valid only on a purchase of $20 or more. EZ Sox back at Zulily! Fun, unique toys on Zulily today!